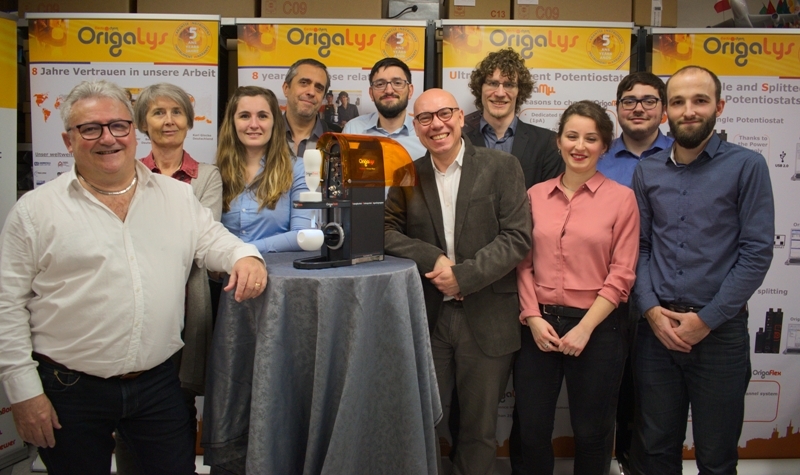 OrigaLys was founded in 2010, by R&D Engineers coming from a famous French Manufacturer (Tacussel and Radiometer Analytical) of Potentiostat,Galvanostat and Impedancemeter (EIS), based in Lyon, France. It's started within a business incubator Cap Nord. Our goal is to propose to the customer "design" products with an affordable price and a high level of quality. OrigaLys ElectroChem SAS is member of AXELERA,chemistry and environment French competitiveclusterfrom Lyon and Rhône-Alpes throughout the world. OrigaLys ElectroChem SAS is also member of FABRILABO, Association of Laboratory Equipment Manufacturers and Traders. "FABRILABO's ambition is to gather all companies involved in the laboratory industry, to promote their products in France and throughout the world." It is an interface between laboratory suppliers and purchasing officers. Represents the industry towards public authorities and major international organisations. Provides for a liaison with other French and foreign professional associations. Runs national shows (Salon du laboratoire, Mesucora, etc.). Participates to AFNOR, CEN, and ISO standard committees.